Arjen Robben, Daley Blind, Nigel de Jong, and Stefan de Vrij of the Netherlands train in Rio de Janeiro, Brazil, Thursday, June 26, 2014. Netherlands will play Group A runner-up Mexico in the second round on Sunday in Fortaleza. Sunday’s matches weren’t supposed to happen. None of the four teams playing was given even a 50 percent chance of reaching the knockout stage by ESPN’s Soccer Power Index-backed model at the start of the tournament. Now two will reach the quarterfinal and one will play a semifinal. 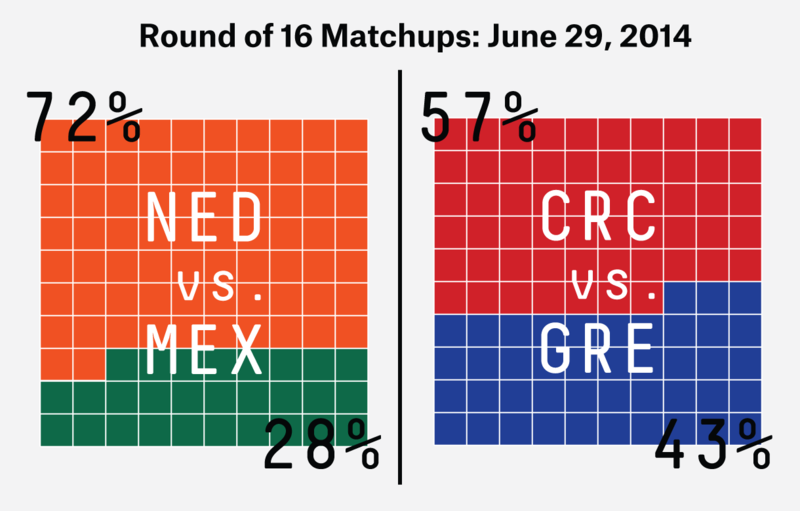 The big favorite of the four is the Netherlands, which has a 56 percent chance of reaching the semis by beating Mexico and then the winner of Costa Rica-Greece. (This is the probability of the Netherlands beating both Mexico and the winner of the second match, weighted by the probability of either Costa Rica or Greece teams coming through.) The Dutch looked like just the third-best team in their group at the start of the tournament. Then they shocked defending champion Spain, 5-1, in their opener, and beat another top team, Chile, 2-0. That’s seven goals against two of the best defenses in the tournament. The Netherlands also beat Australia, 3-2, for a clean sweep of Group B. The Dutch have improved from a long shot to one of the favorites. Before the tournament, our model gave them a less than 1 percent chance of winning their country’s first World Cup. Now they have a 10 percent chance. That’s by far the biggest bump any country got from the knockout stage — it’s nearly twice as large as Argentina’s increase. And none of the other three teams playing Sunday has even a 1 percent chance of winning the Cup. The Netherlands has seen its chances rise partly because SPI has been updated to take into account its dominance in the group stage. Before it looked like the 10th-best team in the world; now it looks like the sixth-best. It also benefits from the weakness of the rest of its draw in the knockout stage; the Netherlands has the third-best chance of reaching the semifinals, ahead of three teams that are better. Notably, Colombia ranks third in SPI but before its game Saturday it had less than half the chance of the Dutch to reach the semis. Mexico is no gimme for the Netherlands, though. El Tri showed its mettle in drawing tournament favorite Brazil and has the world’s fourth-best defense — stronger than any the Netherlands has faced. The matchup of Mexico’s defense, led by goalkeeper Guillermo Ochoa, against the formidable Dutch offense of Robin van Persie, Arjen Robben et al. should be Sunday’s most exciting. The late match won’t be the best played in the Round of 16 — featuring two of the four worst teams to make it out of their groups — but it might be the most competitive. Costa Rica has just a 57 percent chance of winning, the lowest for a favorite in the round, and has a statistical edge of just two-tenths of a goal. Because soccer stubbornly refuses to introduce fractional goals, this could be the second match of the tournament to go to added extra time. Brazil advanced to the World Cup quarterfinals behind two penalty kick saves from goalkeeper Júlio César. Although Brazil continued its competitive home unbeaten streak to 61 games (including 20-0-7 against Chile), the hosts were forced to play on their heels for long stretches Saturday. Chile finished the match with more touches than Brazil (716-703), the first time Brazil has failed to lead in touches at the end of a World Cup game since the 2010 Round of 16. The opponent? Chile. In 2010, though, Brazil cruised to a 3-0 victory. Chile’s advantage in possession was built away from goal, with nearly 100 more touches in its defending half than Brazil (444-358). When Chile threatened to get forward, Brazil was quick to commit a foul. The Brazilians committed 28 fouls, the most in this World Cup and the most by Brazil at a World Cup since 1978 against Argentina. Chile, which has been eliminated by Brazil in all four of its World Cup knockout-round appearances, could not convert when it put the ball in the box. The Chileans failed to complete a cross Saturday (0-for-18). Chile’s 18 cross attempts are the most by a team without a completion at this World Cup. Brazil sat back and turned forward quickly when gaining possession. It had more than twice as many touches in the attacking penalty area (31-14), led by Neymar’s eight. Brazil, which has eliminated its opponent in five of its last six competitive matches that have gone to penalty kicks, completed 71 percent of its passes against Chile, its third-lowest mark in at least the last 50 years at the World Cup. Fortunately for Brazil, its defense performed. Brazil held Chile to one completed pass in the attacking penalty area after halftime (none in extra time), compared with three for Brazil. CORRECTION (9:56 a.m., June 29): This post originally stated that if the Costa Rica match went to extra time it would be the World Cup’s first match to do so. After Brazil’s match yesterday, that is incorrect. It would be the second.